The weather has been a bit chillier and rainy this week so I've been bringing out some of my sweaters and tunics. 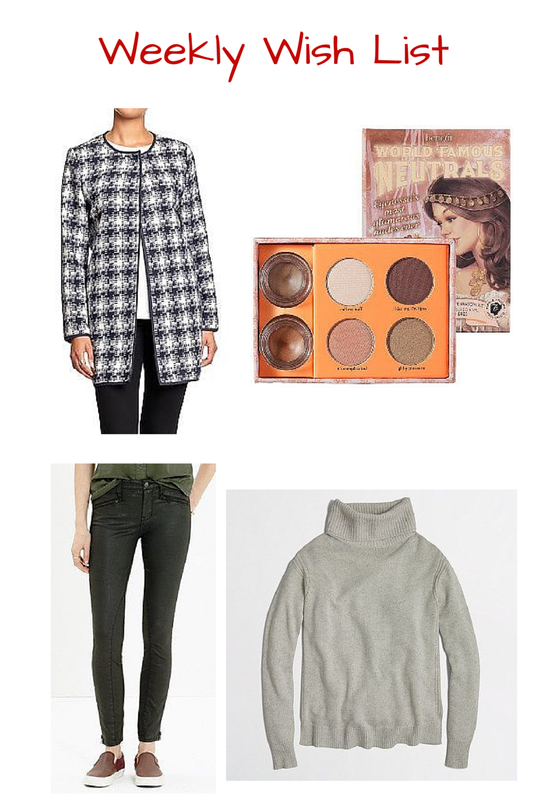 I love this JCrew Factory turtleneck, it looks so comfy and cozy and would be perfect with these coated jeans from Madewell. On the beauty front, I've been making a list of my favorite neutral palettes. My sister just bought this one from Benefit and I'm really interested to see how it looks! Lastly, I'm obsessed with this Old Navy tweet jacket that I saw on Oh So Glam. Who knew Old Navy stuff could look so luxurious? !